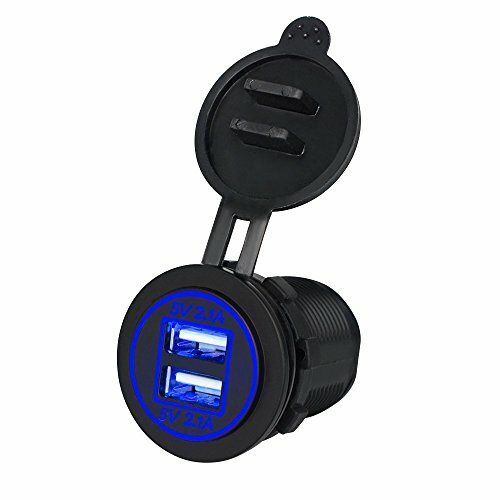 Quick Charge for Motorcycle,Businda Waterproof Power Outlet Dual USB 5V 4.2A with Dustproof Plastic Cover by Businda at RVTE. Hurry! Limited time offer. Offer valid only while supplies last. Welcome to shop from our store! ♥ Businda Dual USB Charger Socket 5V 4.2A for Car Motorcycle iPhone 7/8 Plus Samsung S8/S9 Note 8 iPad Tablet ect. ♥ Businda Dual USB Charger Socket 5V 4.2A for Car Motorcycle iPhone 7/8 Plus Samsung S8/S9 Note 8 iPad Tablet ect. What are you still waiting for?Search for"Businda+product",Click ""Add to Cart"Now & Many thanks for your browse. √ Compact size, easy to install. √ Black tent shell, colored lights,Waterproof and dustproof plastic cover. √ ABS have high temperature and low temperature resistance. √ 4.2A super large current can be used to power mobile phone, tablet, GPS, etc. √ The input voltage is DC 12 / 24V universal voltage, which can be installed on vehicles, motorcycles, trailers, SUVs, boats, yachts, etc.